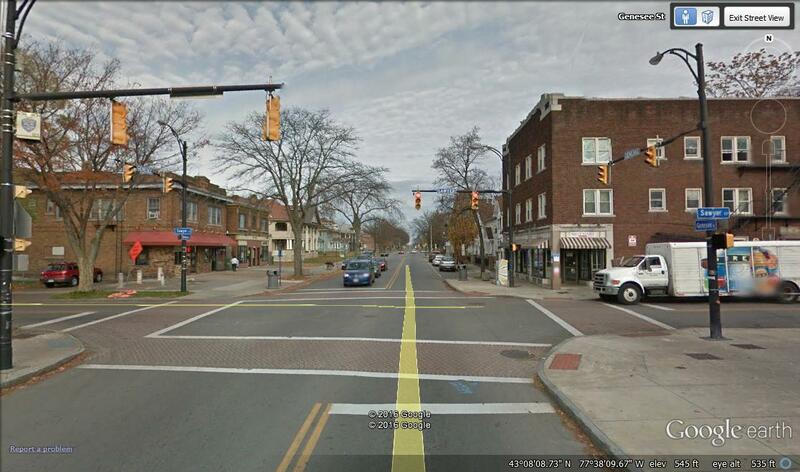 The intersection of South Clinton and Bly, in Rochester. 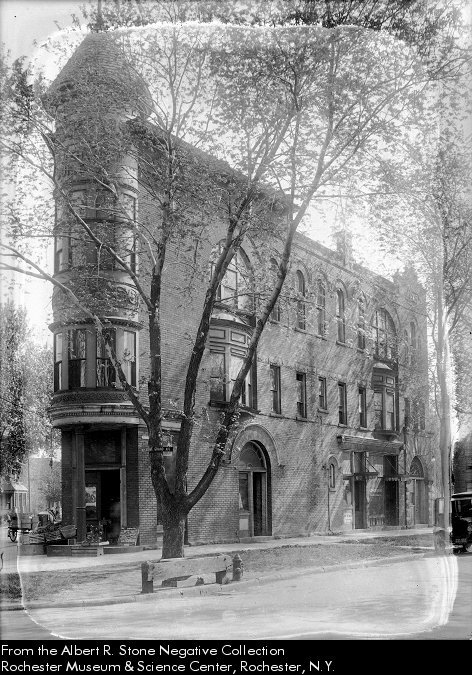 The green and tan building on the right of Bly is early – from before 1890. 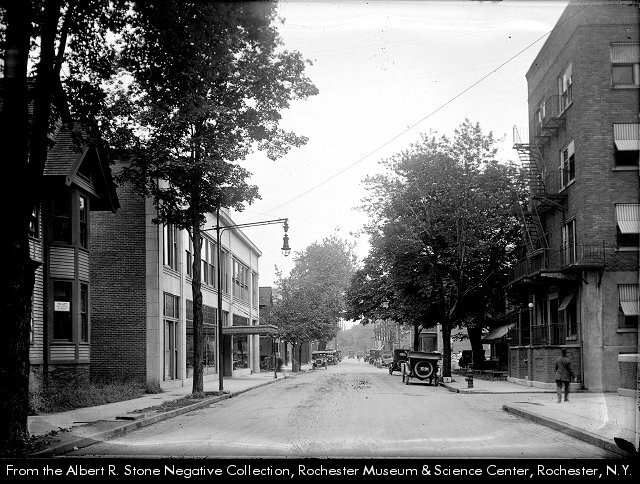 The red building on the left of Bly dates from around 1915. Recognizable? It should be – it is almost certainly present in your city – perhaps right around the corner. Even now this configuration can be found in every neighborhood in our city. 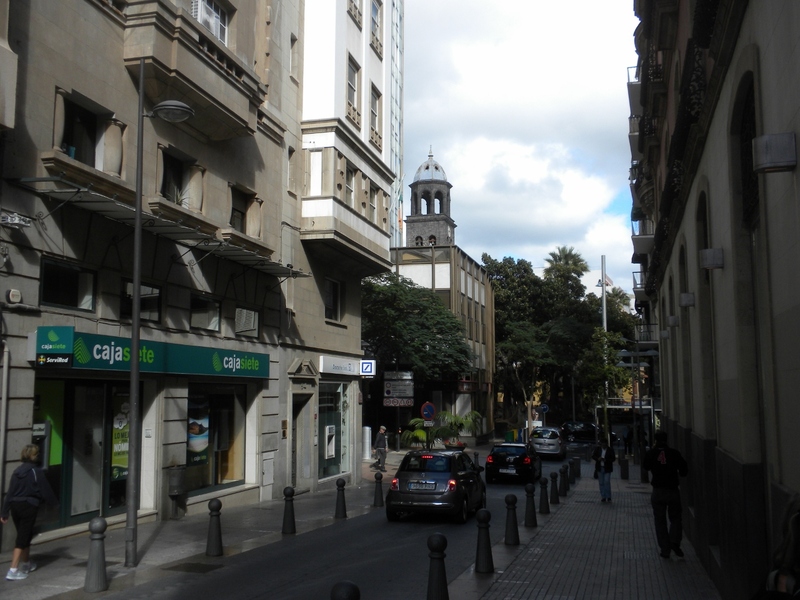 Most often, two two-story buildings to the left and to the right at intersections of busier and less busy city streets. Storefronts on the ground floor, apartments upstairs. Beyond them, houses to the left and right, and down the side streets. A familiar tune, but can you make out the lyrics? 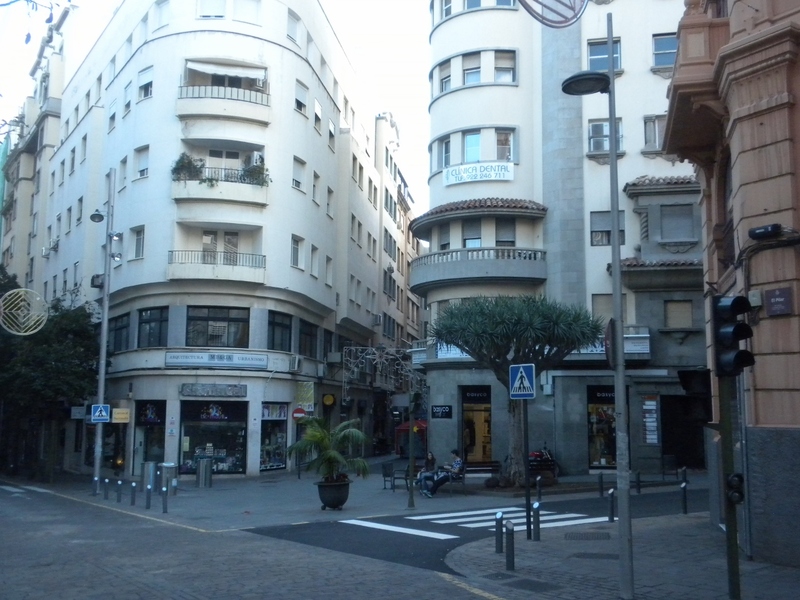 Sometimes the houses adjacent to the storefronts are replaced by other two story mixed-use buildings, if the intersection is of two busy streets. In extreme cases there may be a few three story buildings. 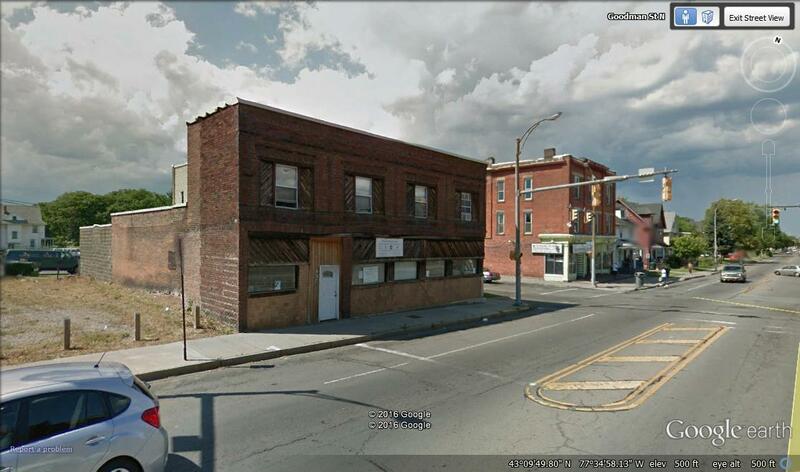 There are almost always ground floor storefronts. What is the story this tune is telling us? This. 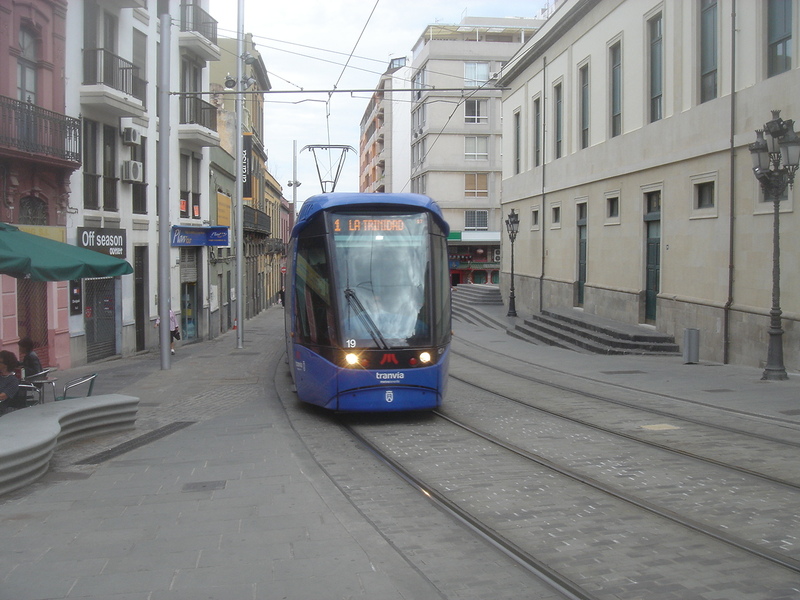 Electric streetcars began here in 1890. The population of the city was about 135,000, and growing fast. Really fast – about 25% to 35% each decade until 1940, when for the first time the population decreased. So let’s focus on that half-century: 1890 to 1940. During those fifty years, mobility for most in this city was on foot, by bicycle, or by streetcar. And the two and three story buildings? They marked the streetcar stops. In mornings or evenings, as you hopped on or off the local streetcar, you could do a bit of shopping, or nibbling, at these places: cafes, bars, shoe shops, cleaners and launderers, bakeries, green grocers, and much more. Then you could walk a block or two and be home. In the city where I grew up, Chicago, these streetcar stops were tied to the grid, were very regularly spaced at 1/4 miles apart, and exerted enormous force in this same half-century in shaping the city and its neighborhoods. Interestingly, the streetcar stops here in Rochester tend to be spaced about 1/4 mile apart also, even though our grid of streets is anything but regular. 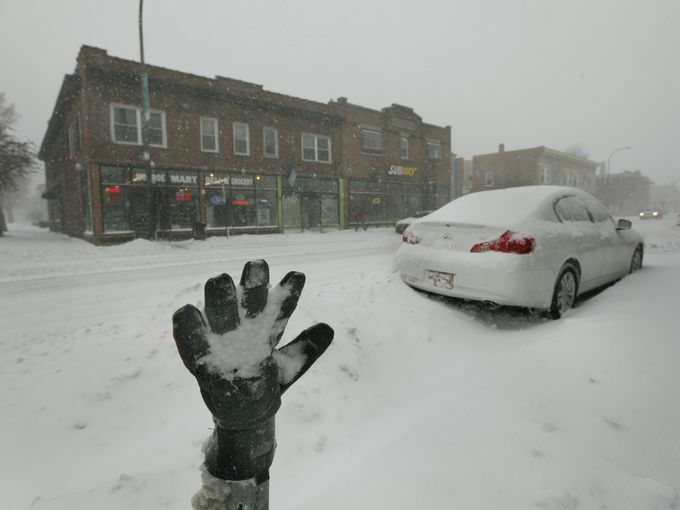 Even then, we understood that a five minute walk – a 1/4 mile walk – was something almost all of us could manage, even in terrible North Coast weather. All the streetcars went downtown because that’s where we all needed to be: for work, to do our major shopping, for our most important entertainment, to participate in our city’s critical institutions. Automobiles wrecked this later, but that’s not a part of this particular melody. And so in neighborhood after neighborhood, on all the city streets that had them, we can find a similar formal expression borne out of the presence of the streetcar. Even though the streetcar vanished here in 1941 – 75 years ago – it is compellingly clear that the city took its shape and form from streetcars, ideas of walkability, the 1/4 mile walk, and the presence of locally based retail and markets. Here are a few more views. This melody, which most can’t hear anymore, is everywhere around us. And the song is actually more resonant than some may suspect. Listen a bit more. The development community saw the streetcar and its rails plopped down across the city, and they were happy to follow. We can examine plat map after plat map, and we find that as the streetcar developed, so did the form of our city. At first there may only have been one or two buildings at a streetcar stop. But later, as the car stop became more important or the neighborhood density increased, developers were happy to put up more 2 and 3 story mixed use buildings adjacent to the stops. 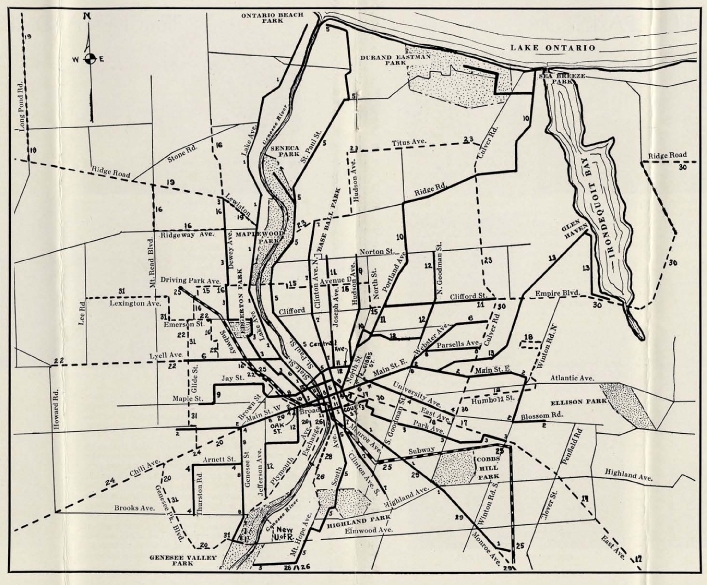 By the time of the 1926 plat maps, the streetcar routes were well established, and nearly every streetcar stop was built up. Here’s Clinton and Bly in 1918. 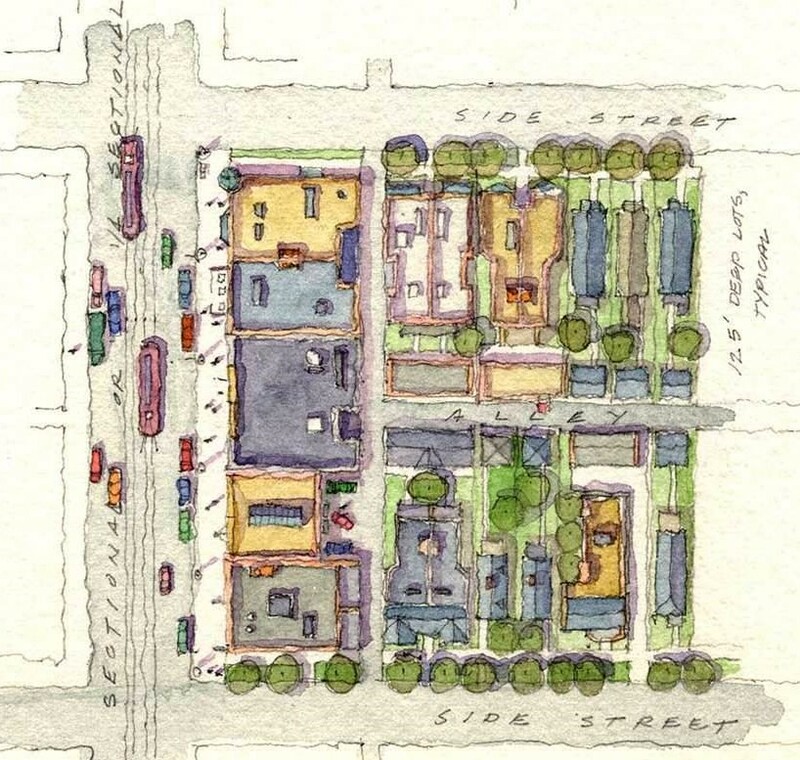 The blue checks mark the mixed use buildings at the streetcar stop. 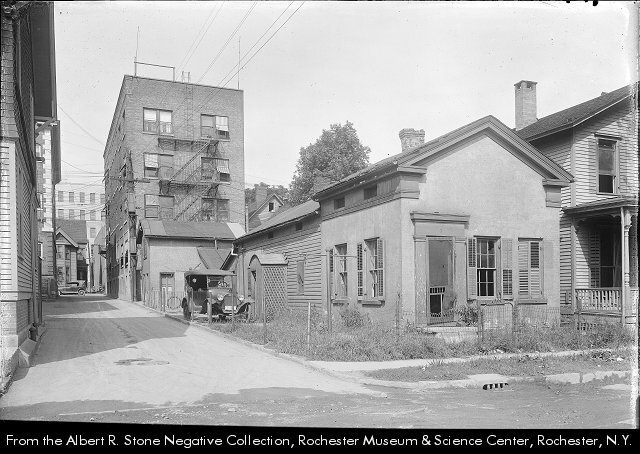 And though these buildings, and many, many more like them, are either gone now or are becalmed in the idling breezes of our cities, they nonetheless constitute the narrative of how Rochester, or Anytown, got to look and feel the way it does. Even today the truth of this tune is well known – urban development follows the rails. As with any story in any city, musical or otherwise, somebody always comes up with a revised version – some new take on the old standard tune. Rochester is no different. Here we go. This is the intersection of Park and Colby, only a few blocks from us. Yes, it was a streetcar stop. 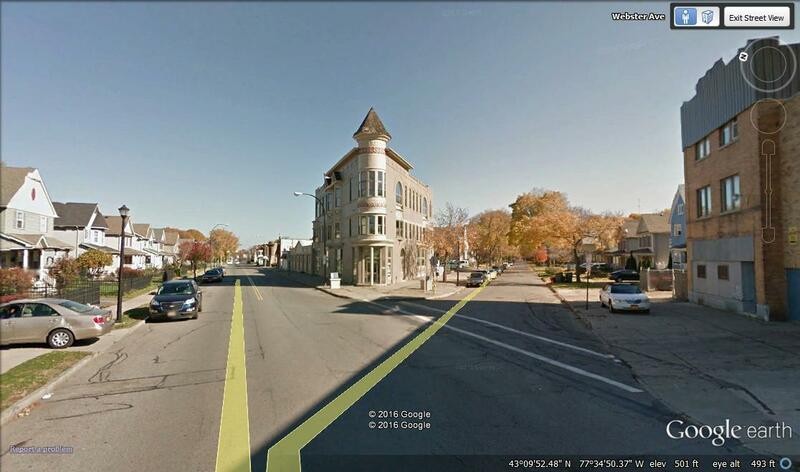 Colby, which runs perpendicular to the plane of this picture, once upon a time dead-ended at the Erie Canal. 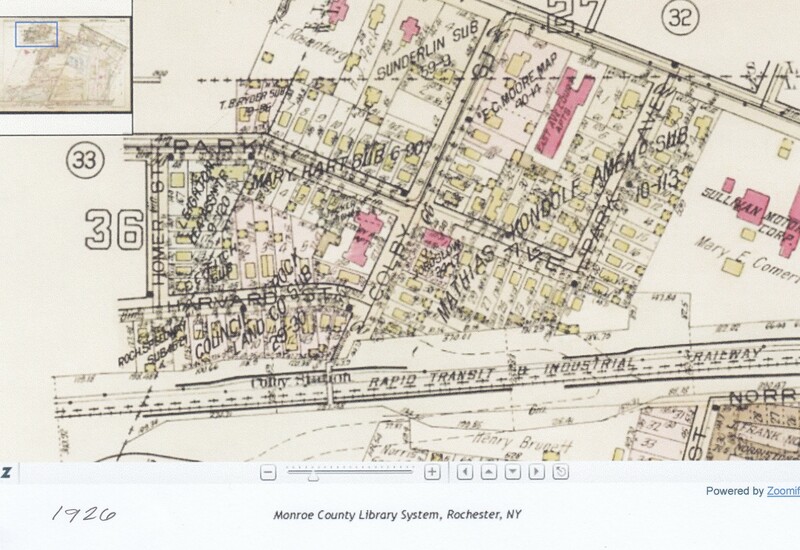 Here’s a plat of the intersection in 1918. The two-story masonry building in the photograph is shown here in pink. 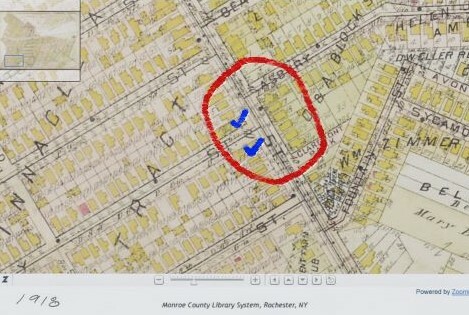 You can see the streetcar tracks, and at the bottom right you can see the pale blue indicating the Erie Canal. Now it gets even more interesting. Here is the plat from 1926. Now the large apartment building shown in the photo is present – it’s the big pink building opposite the little two story pink guy. 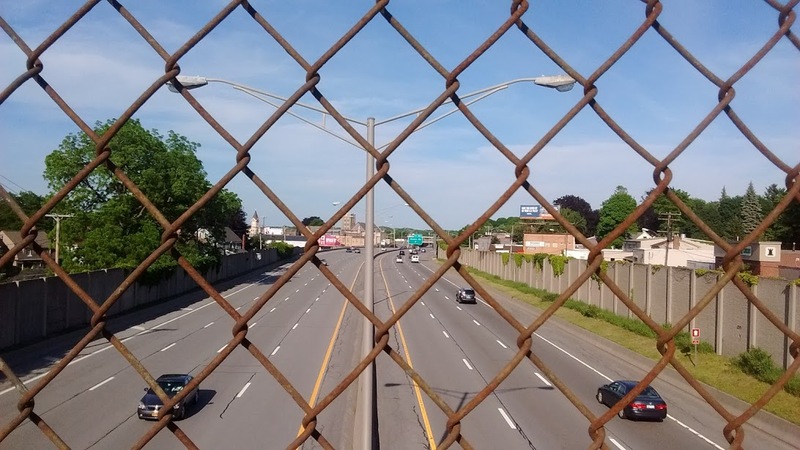 The Colby Station access, now I490, looking east. After 1940 here we ripped out the streetcar and moved to the suburbs. Population here peaked in 1950, and then plummeted as quickly as it had risen between 1890 and 1940. New mobility caused a fundamental shift in how and where we lived and shopped and worked, just as it had before. Nonetheless, the force of the streetcar was slow to fade, and as we have seen, many of us live in the streetcar city even today. 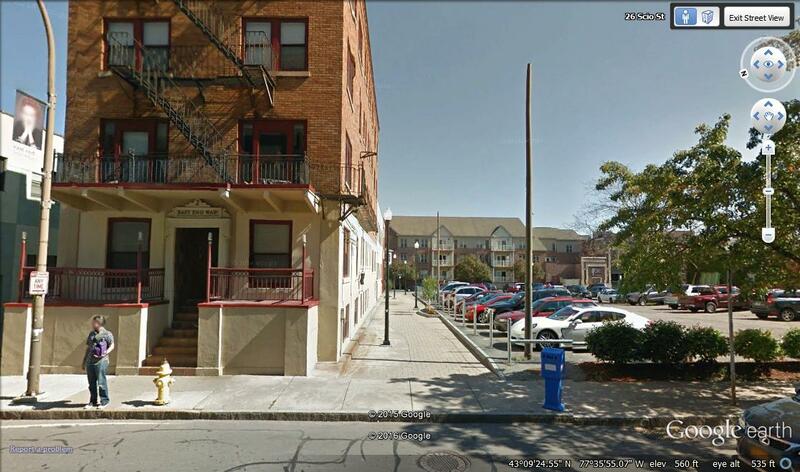 It’s just that there are no streetcars…. How we move defines our urban places. How we move is powerful, even seductive music. 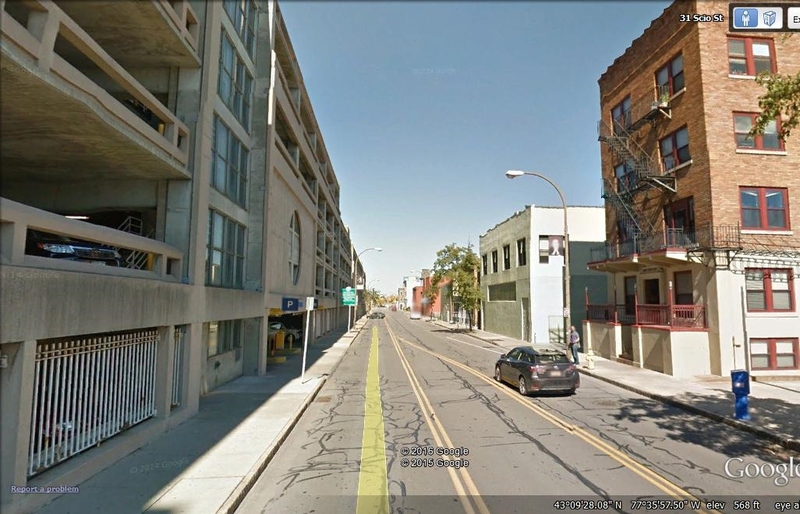 The city of walking and density and mixed-use and localness is a city whose song has ended here in Rochester. But if we can remember that melody, if we can relearn that song, then we can have that place again. Thanks to Jason and Jane. For those of you who have been following us here at A Town Square for a while – 8 years(!?) – what follows may seem like a bit of heresy, but, as we often say, onward. It didn’t have to turn out this way. It’s true that the way it has turned out is what Henry Ford wanted, and the Rockefellers, and Le Corbusier, and GM, but it really didn’t have to turn out this way. Mr. Ford, looking rather smug. 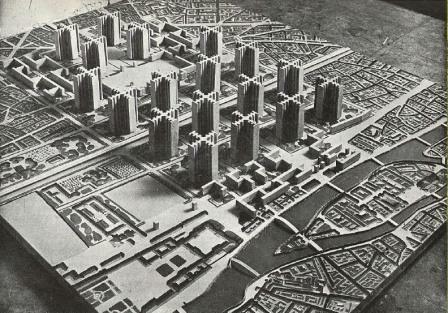 Mr. Corbusier’s Voisin Plan for Paris. GM’s Futurama – the nightmare that came true. Cars have wrecked nearly everything in most every city in the world, and almost everywhere it’s getting worse. But the car has never required us to behave with almost unfathomable stupidity. 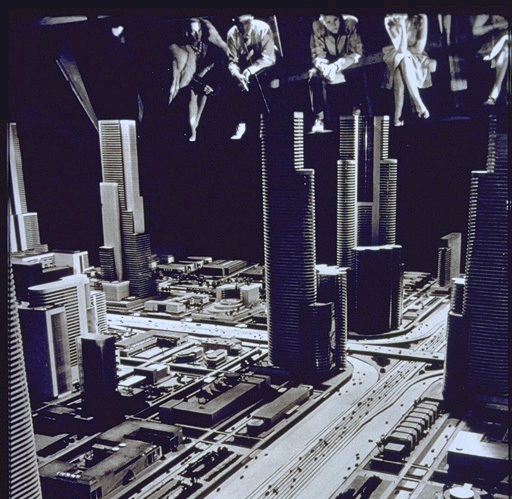 The car never required us to build beltways and inner loops, to raze our downtowns, rip out our terrific multi-modal transit systems, sprawl across our countryside, and build ridiculous strips of monomaniacal shopping. Cars themselves never said we had to abandon the dense, fine-grained, walkable and heterogeneous fabric of our city centers and neighborhoods. It could have been otherwise. So, car people, you can keep your cars, and motor along. That’s the heresy part – we haven’t usually left much room for the future of the automobile in the next city. 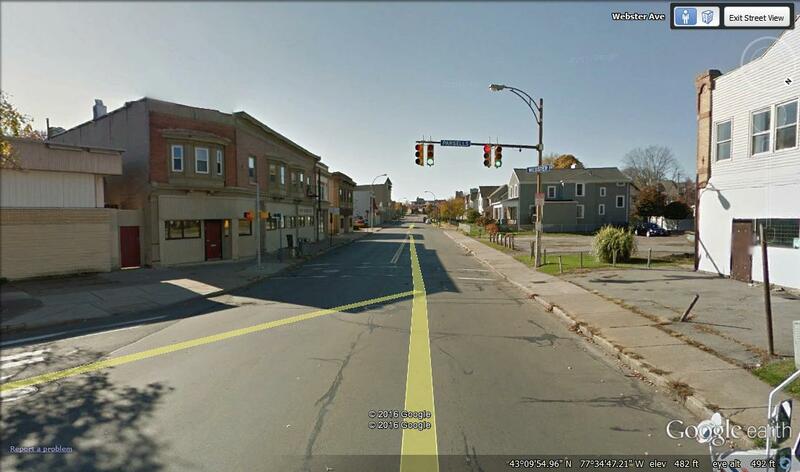 Here in Rochester, as in cities across the world, our task is clear: find ways to put the car in its proper place. And we are actually making some progress. 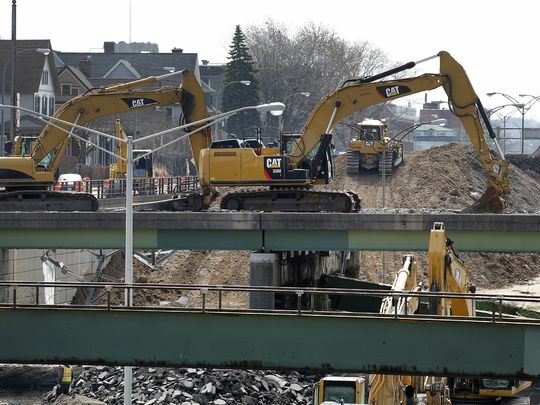 Our inner beltway, here called the Inner Loop, which savaged our downtown for nearly 60 years, is at least in part going away at last. Hurrah! Finding the proper place for cars is, quite simply, a very difficult task. Achievable, certainly, but very challenging. And so as we travel to cities, we watch carefully for evidence that others are getting it right. We want to learn these lessons, witness the results, and then share the good news. Here are a few examples. 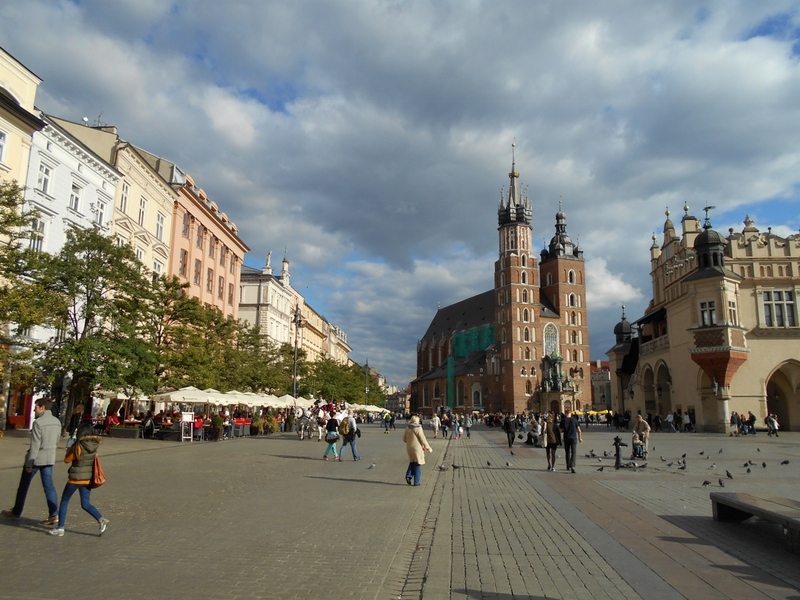 The Old town of Krakow, Poland is a UNESCO World Heritage Site, first on the UNESCO list as that list began in 1994. 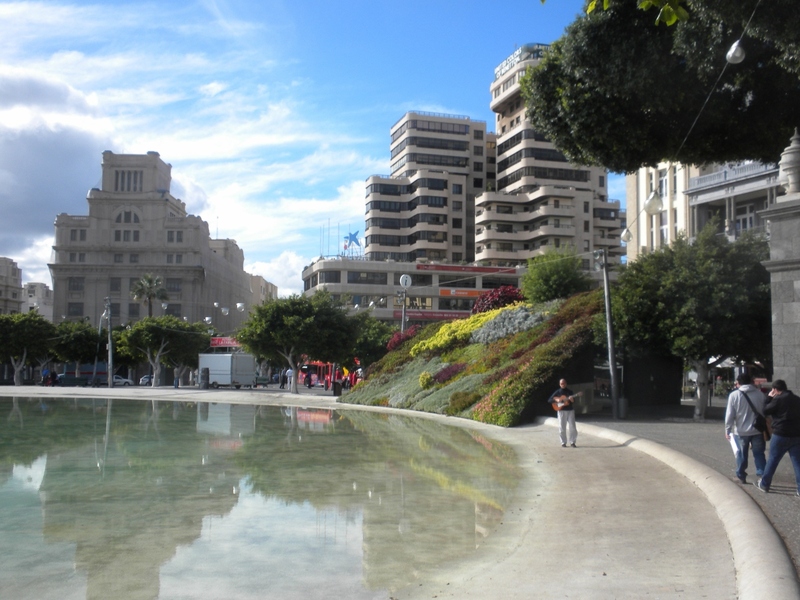 Old Town is encircled by Planty Park, constructed on the foundations of the city’s medieval walls. 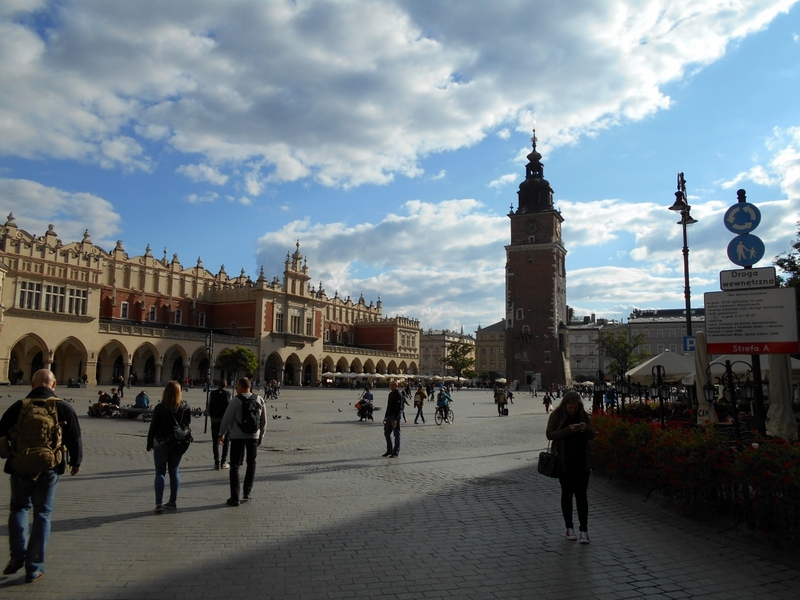 At the heart of Old Town is Rynek Glowny, Market Square, one of the most sensational bits of urbanism on the planet, and unknown to me until 3 weeks ago. (When we stepped into Market Square a few days ago, I had two instantaneous thoughts: “Why have I not known about this place – -it belongs in the top five anywhere”, and “Where are the cars that are usually molesting even the finest urban spaces on earth?”). The cars, except for local residents and service vehicles, were banned in the Old Town in 1998. The qualified ban certainly does not mean no cars – it just means cars in their place. The streets are commanded by walkers, and the cars – with a few exceptions in our experience – do not assume that everyone will instantly jump out of the way. Truly, shared space. 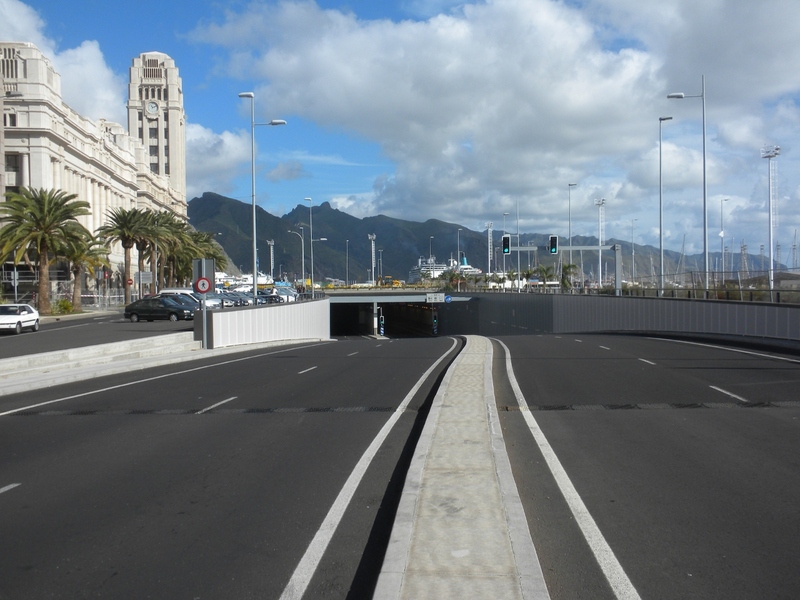 Another great example of a city with the car increasingly in the right place is Santa Cruz de Tenerife. Yes – on an island in the middle of the Atlantic. 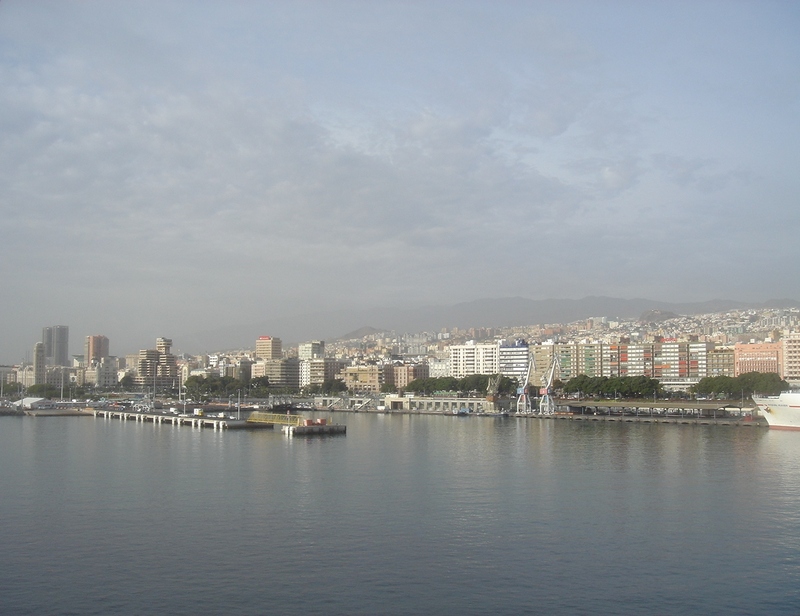 Tenerife is the largest of the Canary Islands, and boasts a population of around a million. 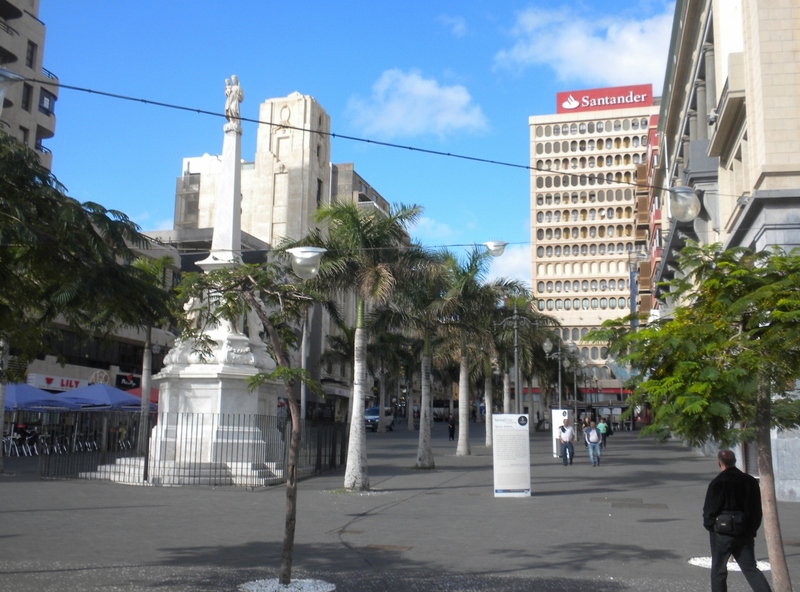 Santa Cruz is the largest city, and the island’s capital. We have been visiting Santa Cruz for quite a while – our first visit was not long after they began service on their streetcar system (now 2 lines, 27 stations, about 10 miles in length). 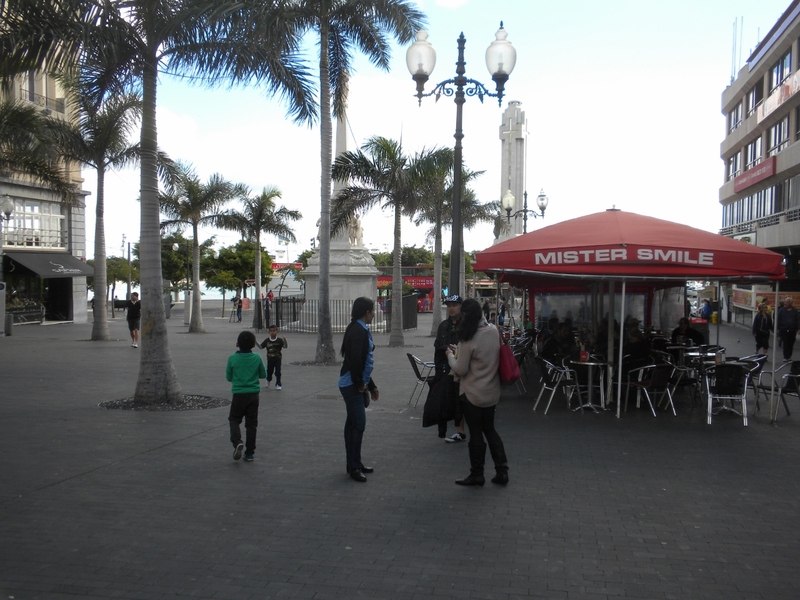 During each visit we could see the city, already a very nice walking city in 2007, improving, becoming less car-centric, with rights-of-way increasingly biased to pedestrians and flaneurs, or as they may say in Santa Cruz, paseantes ocioso. In our most recent visit, the transformation was startling. Plaza de Espana, redesigned by the Swiss architecture firm of Herzog & de Meuron, is wonderfully revived and enlarged, and has become a true downtown centerpiece. But best, the coastal highway that was once a barrier, and introduced rapidly moving automobiles to downtown Santa Cruz, is now GONE. 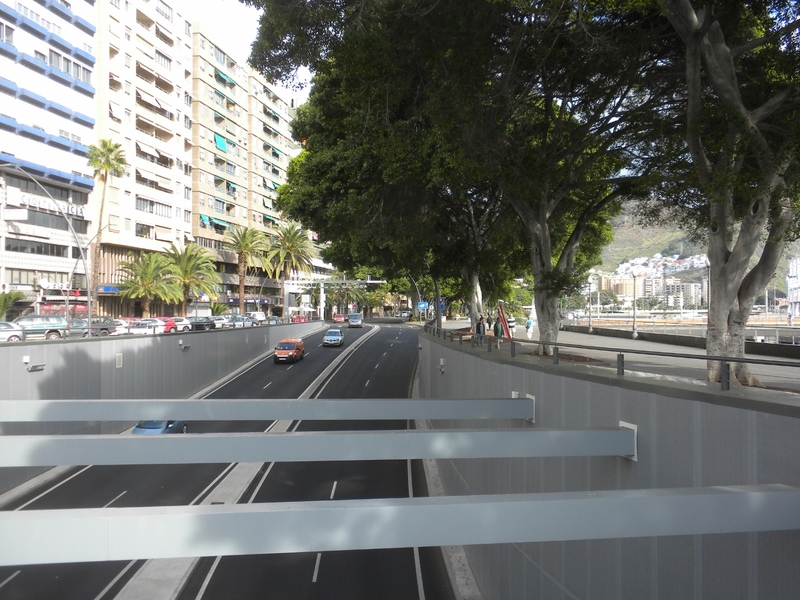 As it approaches downtown from either direction (remember this is an island – it’s all about the edges), it dives beneath the city, includes turn-offs into hidden parking, and then rises to emerge on the other side, clear of the central city. The residue of this, of course, is a very substantial increase in the walkability of Santa Cruz. And as if this wasn’t enough, this has been coupled with changes to most of the downtown streets. They are now paved in cobbles, many feature bollards (or no bollards, ala shared space), and all are linked to the already substantial network of ped streets. Progress! 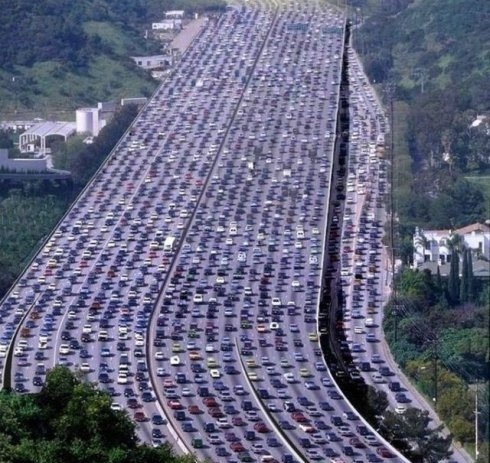 Now this is not exactly breaking down the door of progressive downtown planning, but it is remarkable for the fact that a city of almost 4 million can find the collective will to say that cars are not their only, and probably not their best, future. I wonder what it would take to get our City Council to enact such a document? Or your city. The work of putting the car in its rightful place is the work of building a truly convenient city, and a much better, if not good city. Perhaps if we could see our way to merging convenience and goodness we could make some progress. Onward! 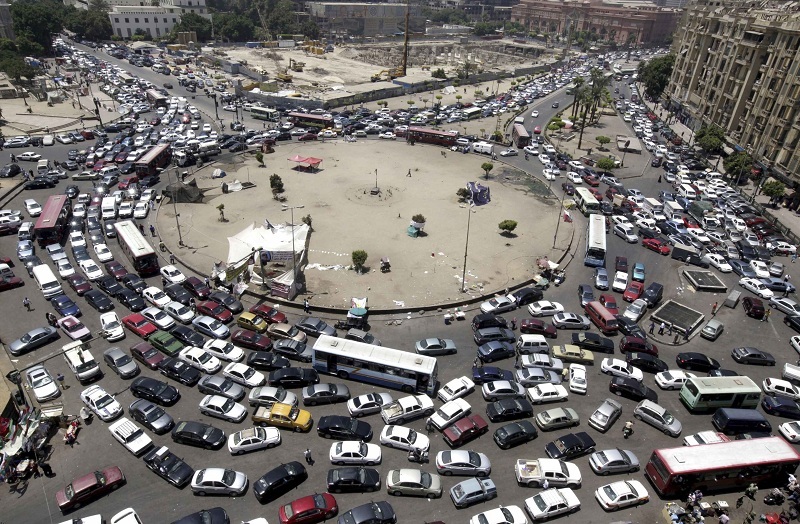 Cairo – Reuter/Abd el Ghany.